Could an Injection Restore Hearing? 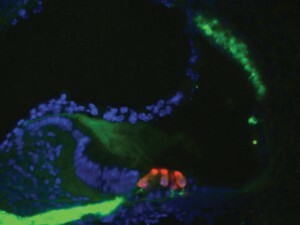 This fluorescent image shows part of an inner ear. In people who have some types of congenital deafness, the intermediate cells (in green at top) of the stria vascularis tissue are absent. Martin Basch is developing an injectable therapy to replace these cells and restore hearing. Nearly three in every 1,000 children in the United States are born with a detectable level of hearing loss in one or both ears. While most research to address the problem has focused on hair cells, which detect sound, the Case Western Reserve School of Medicine's Martin Basch, PhD, is taking a different approach: He wants to fix the tissues that provide the energy that hair cells need to function. At least one-third of congenital hearing loss is the result of defects in this energy-producing tissue, known as stria vascularis. Basch, an assistant professor of otolaryngology, is working to develop a therapy to repair defective stria tissues to restore hearing. Basch said the work is plowing new territory. "There haven't been any studies exploring the regenerative potential of this tissue," he said. Last year he received a three-year, $300,000 Hartwell Individual Biomedical Research Award to fund his work. The Hartwell Foundation provides these awards to help researchers pursue early-stage, cutting-edge biomedical pediatric research. Seven other university faculty members are current or former Hartwell investigators. Basch is working to develop a therapy made with a particular type of stem cell known as neural crest cells. It would be injected into the inner ear to stimulate growth of the healthy stria cells. "It's a very simple, noninvasive therapy to replace tissue that is broken," Basch said. He is using the Hartwell grant to assemble a project team to test his theories. That work could take perhaps two years. If it's successful, Basch would partner with pediatric physicians to develop protocols for human trials.